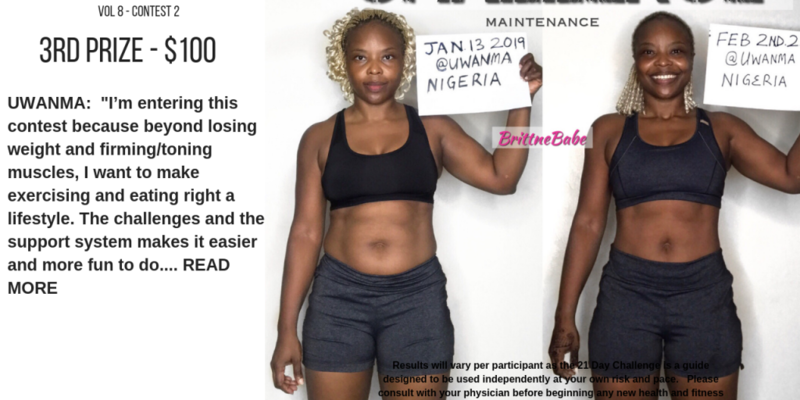 BEFORE: I’m entering this contest because beyond losing weight and firming/toning muscles, I want to make exercising and eating right a lifestyle. The challenges and the support system makes it easier and more fun to do. 21 Days AFTER: I’m super excited at the difference I see in myself! Especially my waistline which was a major body goal of mine; reducing my waistline. I’m also proud of the ladies in the FB group who motivated me when I needed it. I’ll be restarting Vol. 8 with emphasis on my arms & thighs now.